We don't know what this trophy is or who the men are. Can anyone help with identification. The picture surround shows the date 1939 and the word Dingwall appears to be featured as well. Picture of Cromarty Bowling Club. Back row from 2nd left Tom Cox, Tommy Gaskill, Harry Munroe. front row Jake Summers, David Malcolm, Dan (Harbour Master) and Donald Gunn. 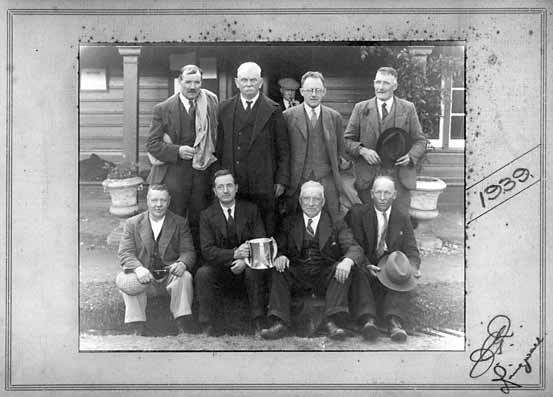 Winners of the very prestigious Dewer cup which you can see above this picture in the Bowling Club. Far left is Colin MacKenzie, father of Babs. Just noticed this one on random search, was back row second right not Tommy Gaskill, former Cromarty Town Clerk? Not Daldon Ross.